Nehemiah Hill is one tough kid. 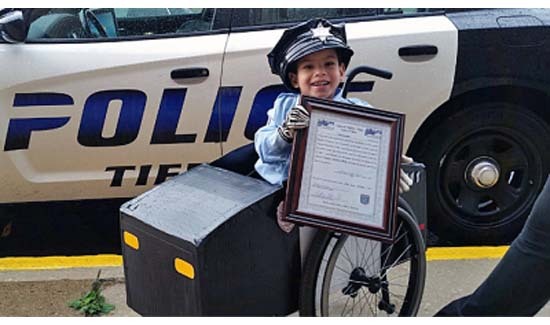 The disabled youngster showed up at his local police station in Tiffin, Ohio last week ready to go to work according to the department’s Facebook page. Nehemiah and his family turned Nehemia’s wheelchair into a police cruiser and he showed up for duty in uniform. The boy got a tour of the police station and was even sworn in as an honorary auxiliary officer for the day. “It was a wonderful experience for everyone working here yesterday afternoon,” Chief Fredrick W. Stevens wrote on the Department’s Facebook page.